So while attending an event with my kids, I spotted a "BBQ" sign in a strip mall near the event. Once I had everyone squared away, I headed over for some lunch at Randy's House of BBQ. The waitress told me snoots were the specialty of the day, but since they aren't my cup of tea I opted for a more traditional pulled pork sandwich. My food came out very quickly. I was surprised that the BBQ chips on the menu were a bag of Lays. I guess I assumed they would be made in house. My bad. The BBQ beans were nothing special either. However, I was far from disappointed with the pulled pork. It was very good. It had the right amount of smoke and seasoning, it was moist and tender, and there was a generous serving on a simple bun. I enjoyed it with the house "competition" sauce. No doubt about, the pork and the sauce were the highlight of my visit. And, I'm always happy to see someone who has taken the time to create their own flavor profile, and bottle it. The have their sauces and seasonings bottled, as they should. Definitely worth the trip. And, if I find myself in that area again I'll definitely be back. Who knows, maybe I'll even try the snoots next time. BBQ joints seem to be opening every other week in my area. Recently, Beast Craft BBQ opened up in the location of a former diner. I've been anxious to try it out, and today I finally had a chance. A friend and I agreed to meet for lunch at 11:30. The parking lot was pretty full when we arrived and when we went inside, the line was 20+ people long and there were no empty tables. I figured this was a good sign. However, nearly every table in one of the dining areas were waiting for their food and the line hardly moved. In fact, more than a few potential customers in line behind and ahead of us chose to go elsewhere based on the slow service. All that aside, how was the BBQ? Pretty darned good. I had the brisket sandwich and hand cut fries, while my lunch mate had the pulled pork sandwich and corn on the cob. All the items were very tasty. The brisket sandwich was served with grilled onions and a house mustard. The pulled pork was served with slaw on the sandwich (as it should be). Beast Craft is bucking one of the most common trends in BBQ joints these days. There was "1", count 'em, "1" bottle of BBQ sauce on the table. And, it was very good. In fact, it might be my favorite part of the meal. I saw no evidence that they're bottling and selling this sauce, but they should. I also like that they are selling soft drinks from a local bottler and not the big guys. However, no self-respecting BBQ joint should ever sell sweet tea that is mango flavored. That's just wrong. I recently visited my folks in Southwest Florida. They know that I'd rather eat BBQ than just about anything else, and they also like to share their discoveries with me. So, when it came time to grab lunch they steered us towards the Sonny's BBQ in Cape Coral. Sonny's is a BBQ franchise with locations in 9 states. A quick look at their website find ~125 locations listed. With that kind of succes, you'd think they must do something right. Turns out, they do. The place was pretty nice and business was a bit slow given that we were late for lunch and early for dinner. Nonetheless, we ordered up some sweet tea and took a look at the menu. It was extensive. I opted for a trip to the salad bar and the brisket plate with a couple of sides. Turns out, I should have skipped the salad bar. The brisket portion was generous, and the side dishes were large as well. The brisket was sliced thin and had a good flavor. I had a little more fat on my plate than I'd prefer, but it was tastey. There was a variety of sauces on the table, all original Sonny's flavors. They were all pretty good, but I opted to enjoy my brisket without sauce. My folks went for the sweet sauce and enjoyed it as well. They had a decent selection of side dishes. I opted for cole slaw and green beans since I've been trying to watch my diet a little. They were both very good, but I was sure wishing for that I'd ordered some of the BBQ beans or baked sweet potato that my folks enjoyed. They looked great. Overall, a solid joint that I'd enjoy eating at again. And, given their growing footprint that's highly likely. Recently, we spent a little family time in Nashville. By now my family knows that we eat BBQ at least once when we travel. 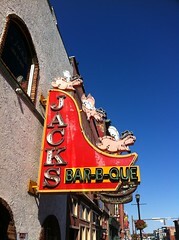 So, after a full day visiting the hot spots in downtown Nashville, we headed over to Jack's BBQ on Broadway. In the middle of the afternoon, there was a line out the door so my hopes were high. There was an unmistakable smell of smoke and BBQ in the air. The place looked like any good BBQ joint with paper plates, sweet iced tea, counter service, and happy diners seated in 3 seperate dining areas. I opted for a 3-meat plate, while my daughters chose kid's meals and my wife got her normal pulled pork sandwich and baked beans. I was disappointed that there was no brisket available that afternoon, so I added chicken to my ribs and pork shoulder plate. I found all 3 meats to be very good. The vinegar-based cole slaw and baked beans were both very tasty and I appreciated the sweet bread. Most joints that I've eaten at over the past few years seem to go with garlic bread/Texas toast it seems. I like a Tennessee vinegar-style sauce, but didn't care much for the house BBQ sauce at Jack's. Being from the St. Louis area, I then tried their KC style sauce and frankly didn't care for it much either. The good news is that the BBQ was really good without it and I usually don't use much of any sauce. Overall, I really enjoyed my trip to Jack's BBQ. If you're visiting the sites in downtown Nashville, Jack's is just a short walk away and definitely worth a visit. 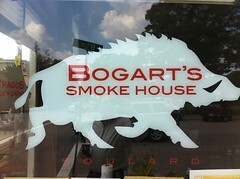 Over the past month or so, I've become aware of a new BBQ joint in St. Louis called Bogart's Smokehouse. Now all I really need is an excuse to go eat BBQ so when one of the owners dropped me a line here at Grill & Barrel asking me to pay them a visit, I had all the excuse I needed. I didn't annonce myself, but I showed up this afternoon on my way home from work. I timed my visit to be just after the lunch rush since I'd heard that they do a crazy amount of business at lunch time. Even at 2:00pm, there were no empty tables inside to be had. I figure that's a good sign. I was met at the door by Mike Macchi, one of the partners, but I kept a low profile, stepped to the counter, ordered a combo plate, and took up a seat to sample the fare. 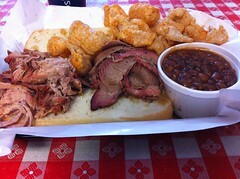 What I got was a plate piled high with brisket & pulled pork on an open hoagie roll, pit beans, and a side of pork rinds. I sampled each of the four sauces that were on the table. They were all uniquely named and uniquely different. 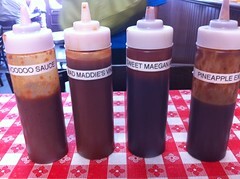 There was what I'd call a St. Louis style sauce called Sweet Maegan Ann's. It's a sweet tomato based sauce. Mad Maddie's Vinegar sauce is a thin vinegar based sauce as the name suggests. Pineapple Express is a thin sauce that unmistakably has a hint of pineapple flavor. And the sauce that I like the best, VooDoo Sauce. That's a thinner sauce with a peppery kick. So how's the food? The pulled pork was some of the best in St. Louis. I really enjoyed the taste and texture, and the VooDoo sauce was a great compliment. The brisket was very good, though I wasn't a huge fan of the rub. I couldn't tell if the rub was applied pre or post cook, but there was a beautiful smoke ring and it was very tender and flavorful. And the pit beans? Some of the best BBQ beans I've had. I learned that they cook the beans on the pit with the brsiket for 12 hrs. They were smokey, peppery, and really tasty. As I was wrapping up my lunch, one of the partners stopped by my table and we began to chat. Mike gave me the background on the relationship between Bogart's & Pappy's (one of my Top 5 BBQ Joints in St. Louis). It turns out that the 4 partners who own Bogart's started it up with Pappy's blessings. They still work with Pappy's, but they now have a chance to do their own thing as well. That's a pretty sweet deal, and Pappy's deserves a tip of the hat for being open to helping their folks spread their wings a bit. Mike took me out back and showed me the Ole Hickory & Southern Pride pits that they're cooking with. We chatted about the pits and he let me peek at the butts that were finishing up on the Ole Hickory. Bogart's is definitely worthy of a stop if you're in the St. Louis area. They're in the Soulard neighborhood between Busch Stadium and Anheuser Busch Brewery, and right behind the Soulard Farmer's Market. I think I'll be revising my "Best in St. Louis" list to include Bogart's. Occasionally, I'll do an Internet search for BBQ to find a new joint to try. Well I did that today and found Stumpy's House of BBQ was only a few miles away from where I was working. So off I went to try it on my lunch hour. What I found was a place that was a cross between a sports bar and a BBQ joint. Red checkered table clothes and corrugated tin made it feel like a BBQ joint. But big screen tv's and sports memorabilia made it feel like a sports bar. You know something? I didn't mind the combination at all. I ordered up the lunch combo platter and a big glass of sweet tea. The platter came with your choice of 3 meats, 2 sides, & garlic bread. 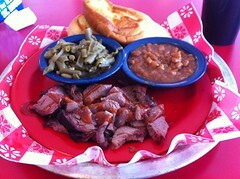 I chose pulled pork, brisket, and ribs to go with Stumpy's beans and green beans. I really enjoyed the ribs. There was only a simple dry rub and no sauce on them, and that's the way I like them. The pulled pork was only average. The brisket however was tough and tasted like roast beef. The sides were passable, but not outstanding. Overall, I enjoyed my meal. The BBQ was average, but I liked the joint. In fact, I like to support local joints like this one who are making a real effort to make a go in a tough business. Here's how I'd rate my experience at Stumpy's. I’ve delayed writing this restaurant review for a long time. I can’t explain why, but I guess it’s because it feels so overly commercial that I don’t place it in the same category as most BBQ joints. Don’t get me wrong, it’s an honest-to-goodness BBQ restaurant, but it just feels like they are trying way too hard to be “authentic”. Bandana’s is a St. Louis based BBQ restaurant that has franchised to roughly 25 locations in 3 states and growing. I’ve tried at least 6 of their locations and I can say that they’re very consistent. But with that consistency, comes a lack of authenticity. This is evident in the way the place feels when you walk in the door. From the wash tub light fixtures to the handkerchief curtains, it’s obvious that they’re executing on a theme. It's like walking into an Applebee's or a TGI Fridays. You know that it's supposed to be kitschy and cool, but it just doesn't feel authentic when there's one on every corner. But enough about how the place looks and feels, how’s the BBQ you might ask? Well, it’s just okay. In at least one of their locations, I’ve seen the pit and they are sure enough cooking on site. However, I wouldn’t say that the results are great. I find the ribs to be too tough, ditto the brisket, and the pulled pork is hit or miss. On the other hand, I do enjoy their side dishes. I like their baked beans, green beans, corn, and especially the garlic bread that accompanies every lunch or dinner plate. Another area where they’ve done a nice job is in their selection of sauces. I can’t say that it's necessarily an original idea, but they have a six-pack of sauces on every table. Each sauce is designed to capture a different regional form of BBQ. From a thick, sweet Kansas City style sauce to a mustard-based Carolina sauce, they offer a taste for just about everyone. The only anomaly here is their Chicago Style sauce. I never knew that there was such a thing as “Chicago Style” BBQ, did you? Banadana's has done a nice job of making BBQ affordable and accessible to a lot of people. I just wish the food was a little better. With a new day, hope springs eternal. And, after yesterday's failed excursion I was hopeful that I'd find better eats at a place called Flavors in South St. Louis. Before I got to the door, I spotted what appeared to be a Southern Pride cooker out back and I could smell the smoke. That's always a good sign. When we walked in, I found what is quite possibly the nicest BBQ joint I've ever been in. All that was missing was white table clothes and fine wine. This place was very nicely decorated and spotless. I wouldn't have been surprised If I'd been handed a fine Italian or French menu, but I was really happy that what I got was pure BBQ. My lunch mates ordered up the pork plates and I went for the brisket. What we received were huge portions of the respective BBQ dinners with 2 sides for less than $10. Quite a value! The pork was very good, some of the best in town. The brisket was close, but the fact that the fat cap wasn't trimmed either pre or post cook meant that I received quite bit of fat on my brisket slices. Other than that, the meat was very good. The side dishes were a mixed bag. My lunch mates really enjoyed a baked potato as a side dish, but being a purist I went for baked beans. What I got resembled a doctored up can of pork and beans. I wish there'd been a little more love and care in the side dishes as there was in the BBQ. Additionally, there was only 1 sauce on the table and I'd swear that it was Original Sweet Baby Ray's in a nondescript bottle. I really enjoyed my visit. I'll definitely go back, but Flavors BBQ could be a couple of sides and an original sauce away from making my list of the best BBQ joints in St. Louis. Over the past couple of years, I've eaten at most of the BBQ joints in the St. Louis area. There are a couple of chains that I typically avoid and I'm sure there are places that I haven't had the opportunity to try. However, I though I'd put together the short list of the places that I think are at the top of the heap in the St. Louis area. Note that this includes the metro-east or Illinois side of the metro area, mainly cause that's where I think you'll find the best BBQ in town. 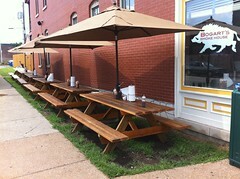 17th St. Barbeque- This is my favorite place to eat BBQ in the St. Louis area. It's one of Mike Mills' restaurants. If you track the BBQ culture, you know that Mike "The Legend" Mills is a well respected competition cook, restaurateur, and pitmaster. If you live in the St. Louis metro area, it's worth the drive to try Mike's ribs in O'fallon, IL. Pappy's Smokehouse -Another joint with great credentials, Pappy's sports some trophies from Memphis in May and folks line up at lunch time to get a taste of some really great BBQ. Pappy's has also been featured on food & travel shows on cable TV. They're located in the downtown area so there's no excuse not to sample their fare, but get there early. When they run out of BBQ, they close early. Plush Pig- This is a place that I nearly overlooked when they were located in downtown Clayton, MO. They've since relocated, revamped the menu, and if possible made the BBQ even better. Still one of my top 5 places to eat BBQ in St. Louis, they're now located at McKnight & Manchester. Hick's BBQ- Another Illinois place, I discovered them after buying some of their sauce at a BBQ shop in St. Louis. I've enjoyed their BBQ a couple of times, but when I attended a backyard party that they catered I really became a fan. I highly recommend their sauce and their BBQ. I've also had the opportunity to meet the owner and he's a super nice guy, further reinforcing my belief that if you BBQ you're my friend. So there you have it gang. To my taste buds, these are the best BBQ joints in the St. Louis metro area. Who'd I miss? Which joints do I need to visit? Where do you think the best BBQ in St. Louis can be found? Drop me a comment and let me know. Okay, so it’s not a BBQ joint strictly speaking. But, they do serve BBQ along with lots of other stuff cooked like mama used to. It had been a few years since I’d eaten at Lambert’s Cafe but a recent family road trip afforded me the opportunity to share this unique place with my wife & kids. If you’ve ever driven through the state of Missouri, you may have seen the billboards for Lambert’s Cafe. Their tag line is “Home of the Throwed Rolls”. And they literally mean “throwed rolls”. Patrons of Lambert’s know that when you’d like more bread (in this case, yeast rolls the size of a softball) you need only look for the server pushing the cart of rolls fresh from the oven. It’s not necessary to wait for them to make their way to your table. Simply hold up your hands and be ready to catch a roll tossed in your direction. Lambert’s serves a variety of entrees all cooked in a down home sort of way. 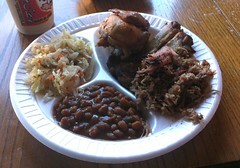 Everything from fried chicken, BBQ ribs, & frog legs to salads served on a bread plate the size of a hub cap. And it’s all good. Most entrees are served with your choice of 2 side items, but Lambert’s is also known for their generous servings of “pass-arounds”. A constant parade of servers dish up macaroni & tomatoes, fried potatoes, black-eyed peas, and fried okra to anyone who’d care for them. This along with the generous portions, and you should never go away from Lambert’s hungry. Lambert’s has three locations; Sikeston & Ozark, MO and Foley, AL. They’re so popular that you may have to wait a bit for a table, but trust me it’s worth it.